The Tri-Village Quarterly Magazine is a high gloss, 60 pound paper weight (high quality) magazine made up of local businesses and businesses that serve the area. Most of the businesses have an offer of some kind to draw in new business, and also use the coupons as a tracking tool. It is a great creative advertising medium as it is affordable, high quality, community oriented and localized, where the majority of local businesses get their customers from. The magazine has 12 or 16 pages which makes it easy for an ad to get noticed and is filled with colorful, professional looking ads designed by a local graphic artist with 20 years experience! It is direct mailed to 16,000 households and when homeowners see the magazine in their mailbox, they are curious and look through it! Ads will get noticed and people will use the coupons to save money! 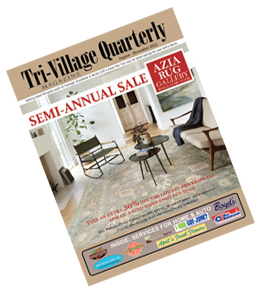 The Tri-Village Quarterly Magazine mails to 16,000 residences in Upper Arlington south of Fishinger Rd. Grandview Heights and The Village of Marble Cliff including areas of Columbus west of the Olentangy River and just west of Riverside Drive between 5th Ave. and Lane Ave. The primary zip codes of distribution are 43212 and 43221 with a 1,000 residences in the 43204 zip code just west of Riverside Drive, between 5th Ave. and Lane Ave. The area of Upper Arlington south of Lane Avenue is considered the historical area of Upper Arlington. Many of the homes date back to the founding days of the city and are well-maintained adding to the character and charm of the area. The City of Grandview Heights is situated between the Olentangy River and State Route 315 to the east, the Scioto River and I-670 to the south, Riverside Drive and Marble Cliff to the west, and W. Third /W. Fifth Avenues, Columbus and Upper Arlington to the north. The city enjoys excellent interconnectivity with regional highway systems, including I-670, U.S. Route 33, and State Route 315. This puts the community just a few minutes drive from the Short North/High Street Commercial Corridor, Victorian Village Historic Neighborhood, the Arena District, Ohio State University, Battelle Memorial Institute, major medical centers, downtown Columbus, and the Columbus airport. 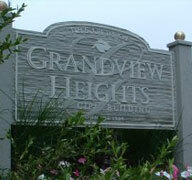 Grandview Heights is a small, close-knit community with a total population of 6,389 residents. The city’s current businesses are very active in supporting everything from local baseball teams to renovation of parks and ball fields through financial and in-kind donations. In return, both the city and its residents support businesses through shopping and buying in Grandview, as well as offering support, resources and incentives for businesses that want to move to or expand in Grandview. Annual community events, such as the Ox Roast, Lazy Daze Festival, the Cycling Classic, Pumpkin Run, Concerts on the Lawn and more offer opportunities or involvement by local businesses and their employees. The Village of Marble Cliff is a small parcel of land located between Columbus, Grandview and Upper Arlington. It’s so small– with a total population under 600 people–that most people in the Columbus area are not aware of it unless they live nearby in Grandview or Upper Arlington. 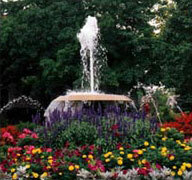 It sits between Fifth Ave. on the north, Riverside Dr. along the Scioto River on the west and Cambridge Blvd. in the 43212 zip code. Marble Cliff is one of Columbus’ early-developed suburbs and is comprised of many stately homes. It is conveniently located nearby many restaurants, shops, galleries, entertainment venues and Downtown Columbus. In 2006, “Columbus Monthly” chose Marble Cliff as one of Central Ohio’s best neighborhoods and top places to live.